Home » Posts » What is Deep Dental Cleaning? 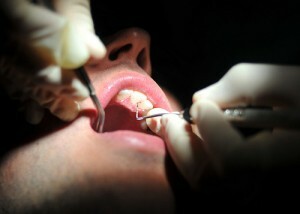 What is Deep Dental Cleaning? What does Dr. Norman do during these visits? During these visits, Dr. Norman in Maryville, TN performs a routine check-up which would evaluate the condition of your gums and teeth but also see if you are showing early signs of oral cancer. At the same time, Kim Norman, DDS Dentistry for the Individual in Maryville, TN will also performs a deep dental cleaning in the form of a scaling and root planing procedure. This dental deep cleaning procedure is an effective yet minimally invasive procedure which gets rid of plaque and tartar, and can treat mild gingival diseases. What Dr. Norman does during this procedure is remove tartar, mineralized deposits, which are often found along the gum line and crevices on the surface of your teeth. However, by removing these calcius deposits, the pockets or gaps in between the teeth and gums widen, and the dental roots become exposed. In order to prevent more plaque from adhering on these surfaces, Dr. Norman will then smooth or plane out the exposed dental roots. While the procedure is not classified as invasive, it’s still very much possible for bleeding to ensue because of the accidental cutting of the gums when removing tartar. For this reason, the staff at Kim Norman, DDS Dentistry for the Individual in Maryville, TN may opt to use local anesthesia in order to numb up your gums. If the tartar build-up is extreme or if you have severe gum disease, Dr. Norman may opt to perform the procedure in quadrants to make sure that you are truly comfortable. On top of numbing gels and local anesthetics, Dr. Norman may also prescribe you with antibiotics in order to help aid and expedite the healing process. If the pockets are more than 3 mm deep, then Dr. Norman may require you to go through a number of other treatments. In order to control and even treat your existing gum disease, Dr. Norman might prescribe you with a special mouth rinse which will minimize plaque and tartar formations. Make sure you visit Kim Norman, DDS Dentistry for the Individual in Maryville, TN twice yearly to keep your smile healthy.